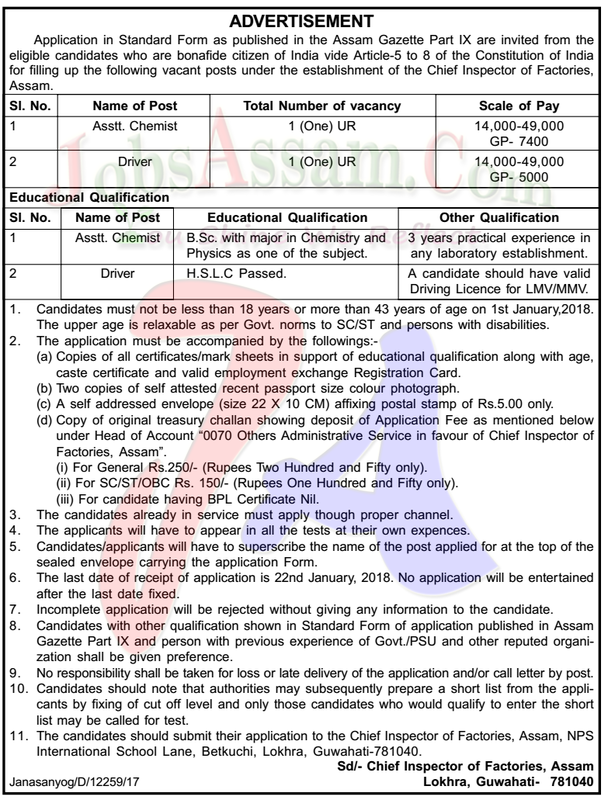 Application in Standard Form as published in the Assam Gazette Part IX are invited from the eligible candidates who are bonafide citizen of India vide Article-5 to 8 of the Constitution of India for filling up the following vacant posts under the establishment of the Chief Inspector of Factories,Assam. Educational Qualification: B.Sc with major in Chemistry and Physics as one of the Subjects. 1.Age: Candidates must not be less than 18 years or more than 43 years of age on 1st January,2018. The upper age is relaxable as per Govt. norms to SC/ST and persons with disabilities. (d) Application Fee:Copy of original treasury challan showing deposit of Application Fee as mentioned below under Head of Account “0070 Others Administrative Service in favour of Chief Inspector of Factories, Assam”. 3. The candidates already in service must apply though proper channel. 4. The applicants will have to appear in all the tests at their own expences. 5. Candidates/applicants will have to superscribe the name of the post applied for at the top of the sealed envelope carrying the application Form. 6. The last date of receipt of application is 22nd January, 2018. No application will be entertained after the last date fixed. 7. Incomplete application will be rejected without giving any information to the candidate. 8. 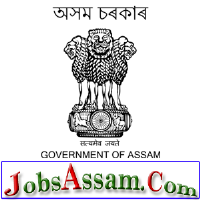 Candidates with other qualification shown in Standard Form of application published in Assam Gazette Part IX and person with previous experience of Govt./PSU and other reputed organi zation shall be given preference. 9. No responsibility shall be taken for loss or late delivery of the application and/or call letter by post. 10. Candidates should note that authorities may subsequently prepare a short list from the applicants by fixing of cut off level and only those candidates who would qualify to enter the short list may be called for test. 11. The candidates should submit their application to the Chief Inspector of Factories, Assam, NPS International School Lane, Betkuchi, Lokhra, Guwahati-781040.